Florham Park, New Jersey, approximate population 12,605. It is a neighborhood known for its small town feel, fine school system, library, community events and activities. In 1988, when Allison Josephs was a fourth grader, she liked living in this town where neighbors felt a kinship with one another and peers were well-acquainted at her local public school. While her classmates were poring over "Choose Your Own Adventure" books and knotting friendship bracelets, Allison's busy mind raced most nights, thoughts overpowering and too profound for a child her age. Allison could not make sense of the world, how it began and its infinite continuum. But it was not until tragedy shook the suburban Morris County community that Allison's thoughts took shape and an active form, when the potential met the kinetic and her life was forever changed. December 12, 1988 started off as an average Monday morning for Allison. She woke up, got dressed and went to school, but when she arrived, it was quiet and she spotted students in Homeroom crying. Immediately, she knew that something was off. As the story came together, it made little sense to the fourth grader and her friends. Angela Damiano, a kind and personable classmate, had been killed along with her brother by their father over the weekend. Albert Damiano, 40, had then turned the gun on himself. Allison would later hear that there had been some warning signs about Albert, who suffered from severe depression, but no one imagined that he would not be able to babysit his children while his wife attended a birthday party. No one foresaw the calamity ahead of time. Allison would try to wrap her head around the occurrence many times while lying awake in bed: How could this have happened to Angela? What happened when a person died as far as the world at large? If Angela, just a child, could cease to be in this world, what did her life mean? If the world kept continuing....? Allison particularly thought about the continuum of life in this world, of birth and new lives, and she would revisit those thoughts when her mind raced at night, instead of considerately allowing her sleep. "Objects in motion will continue unless you change your course," Allison says now about her childhood reflections. Back then, her mind went deep in the dark of night, and not being extremely religious, but from a Jewish family, Allison thought about the God of her forefathers. What was his plan? Clearly there was something behind everything and the world...She would later conclude from discussions with her father that the world was infinite and the subject of infinity repeatedly gave her much pause. While some children grow up to become adults who toss the notion of a higher power and a Creator aside, who scoff at the idea of religion in a world that can seemingly disregard a little girl, Allison wondered about God and his designs. She would see his work through a flawless tree in Hawaii while on vacation years later with her parents. She would initially seize the tree up as if part of a superb painting, or a prop on a television set. But the tree was not a studio model, she would marvel, even if it seemed it had been created with a paintbrush! It was real and so seemingly miraculously, intricately detailed, a spectacular creation of this world. Allison's parents sent her to a religious high school program where she took classes a few times a week. Their intent was for her to meet nice Jewish boys, but she found herself drawn to a course on how the Chinese Tao Te Ching correlated to Judaism's Pirkei Avot (Ethics of Our Fathers), how the uniquely worded lessons taught in two entirely separate cultures and languages could be interwoven and sound nearly identical. She began forming more connections about life and meaning and how, sadly, the death of Angela Damiano had set the wheels in motion for this inner monologue. ...A monologue which became a dialogue. Spirituality and prayers came together for Allison as they do for one who sees meaning in, and a connectedness to, everything. When she approached her father and told him she was embracing Orthodox Judaism, he scoffed at the idea, but then agreed to study and really delve in to what he was rejecting for his daughter. After all, his daughter reasoned, in order to naysay what she wanted to take on, he should know what he was refuting. Surprisingly, Mr. Josephs would come back to Allison later and tell her that everything made sense, that he couldn't quite believe it himself but now he was a believer in Orthodox Judaism. Today, the family that Allison grew up with is orthodox. In her 30s, her husband and her children live the same lifestyle as her parents: They are all Torah-abiding, infused with spirituality and focused on learning and growing in Judaism. On the outside, Allison looks like a modest fashionista who you might spot at New York Fashion Week. She covers her hair stylishly, often with a customized wig, as many modern orthodox women do, adhering to the ruling that married women's real hair is to be seen exclusively by their husbands. She wears dresses that fall to the knee or below and are sometimes created by the likes of fashion designer Terri John. You can sense that Allison puts thought into her attire and as the British say, she looks "smart." All of that is woven with the internal Allison, the thoughtful, always connecting mind that forfeited nights of sleep as a child, tossing and turning while making sense of the world. Although it began with the tragic death of a classmate, she has never stopped to discover and understand things that pertain to life, the world in its infiniteness, Judaism, one's connection to God and how He (or She, readers) may operate. 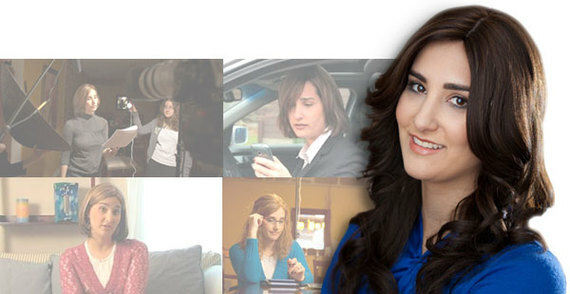 As someone who never stopped exploring as an adult, Allison founded Jew in the City, whose mission, according to its website, is to "publicize the message that Orthodox Jews can be funny, approachable, educated, pro-women and open-minded--and that Orthodox Judaism links the Jewish people to a deep and beautiful heritage that is just as relevant today as it ever was." Whether it be through comedic videos shared through social media or upscale events, Allison is focused on imparting the awesomeness of Judaism and showing others what is cool and unexpected about those in the Modern Orthodox and Orthodox Jewish community. Allison still reflects a lot on the tragedy that hit her town and how it might have affected the surviving Damiano relatives. She thinks of the sweet little girl who shared and was so likable as a classmate. She considers how lives are not wasted or in vain but purposeful and what she may have learned from Angela. If she can do one good thing in Angela's memory, if she has learned one thing from the little girl, Allison notes that she will do it. Aside from sharing, Angela wasn't one to complain and had traits that those living can exemplify on a daily basis. Infinity, Allison thinks, remembering a conversation she had with her father about how the ocean waves keep coming and coming. While babies are born and people die, a new wave is formed, and then another. As the waves wash over the sand repeatedly, it is a part of the continuum of the world. "I give my thanks to you (each morning) for having returned my soul to me" go Allison's prayers upon waking up. She appreciates what it means for every living person to be a part of this continuum. Then she gets to work, savoring the purpose of her organization and her mission, inspiring other people to think deeply and discover the interconnections in life and the miracles around them that no paintbrush, other than God's, could create.